WILMINGTON, DE - MG Muscle Champion, Marica "Marci" Williamson lived her life full of joy and excitement! She focused her time, energy, and devotion to her three children who she loved dearly. Marci was well-known in her local area as one of the best hairdressers! In fact, despite the physical limitations presented by myasthenia gravis (MG), Marci still managed to persevere and style hair for her friends and family. She was talented, creative, and phenomenally artistic! Marci was also a state champion bodybuilder. Marci was proud to win four trophies during a one-day competition! She won 1st place in the Bodybuilding Featherweight Division, 4th place in the Crowd Favorite Figure Competition, 1st place for the People's Choice, and Over-All Best Figure in her 2006 show! Marci lived relentlessly; overcoming the symptoms of myasthenia gravis (MG). MG is a neuromuscular autoimmune disease that causes fluctuating muscle weakness, paralysis, and fatigue throughout the body. The disease may cause diplopia, dysphagia, dysarthria, weakness in the arms, legs, neck, face, and diaphragm muscles. A myasthenic may experience a "MG crisis". This occurs when one's diaphragm muscles become too weakened for the individual to breathe on their own. There is currently no cure for MG, only treatments that may help manage the symptoms. Muscle Movement Fnd. 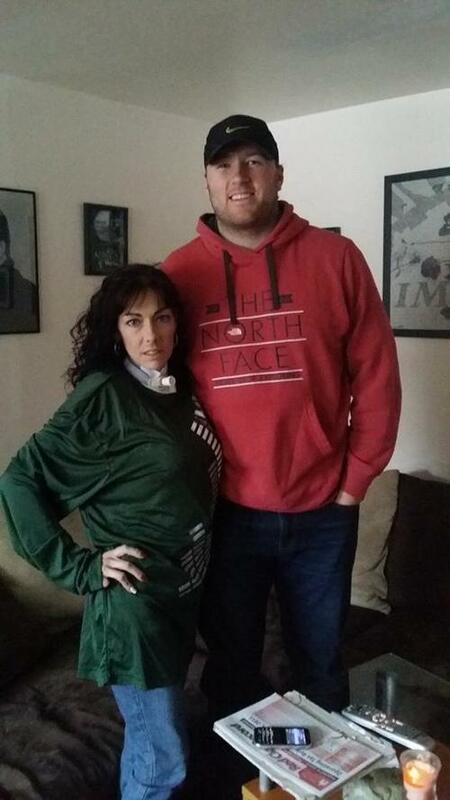 Advocate and Professional Football Player, Justin Perillo, on a home-visit with Marci in 2015. Justin surprised Marci with authentic and signed memorabilia. Marci wore this apparel all season! Muscle Movement Fnd. Advocate and Mixed Martial Arts Contender, Brandon Davis, on a home-visit with Marci in 2016. Brandon dedicates his fights to "Knockout Muscle Disease"! The Saint Mark's High School vs. Salesianum High School "Sack Muscle Disease" Alumni Football Game! Muscle Movement Fnd. Founder/President and MG Muscle Champion, Rob DeMasi, introduces MG Muscle Champion, Marci Williamson to the Salesianum and Saint Mark's Football Alumni before the game. A very special moment for Marci and Rob! Alumni from Saint Mark's High School and Salesianum High School united in a flag football game and honored Marci as their Muscle Movement Fnd. Muscle Champion! They dedicated their performance to Marci's courageous fight! The Smyrna High School Wrestling "Pin Muscle Disease" Match! Marci was honored as Smyrna Wrestling's Muscle Champion and helped deliver the Muscle Movement Fnd. message to the audience at the wrestling match! Today, we celebrate Marci's life. We remember her for her relentlessness, courage, and ability to dictate her happiness in life. We remember Marci for never allowing her obstacles to affect her happiness, motivation, or desire to be the best person and mother she could possibly be. Marci is and always will be a true Muscle Movement Fnd. "Muscle Champion"! Relatives and friends are invited to attend Mass of Christian Burial at St. Anthony of Padua on Tuesday, February 27th, at 11:30a.m.